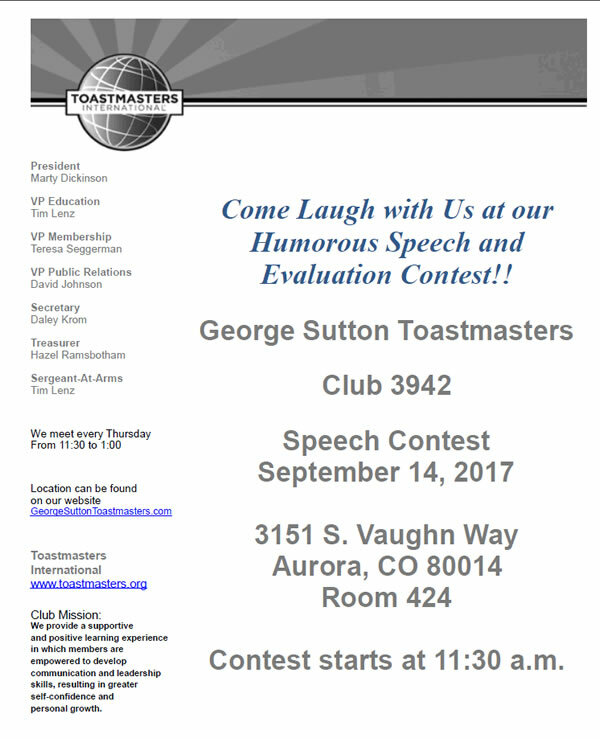 Our fall 2017 humorous speech and evaluation contest is a great opportunity for guests to come see what Toastmasters can offer at a competitive level. It will be held on Thursday, September 14, 2017, from 11:30-1:00 p.m. at our normal location at Colorado Technical University (TCU Aurora). Visitors get to just watch the show and you will not be called on for the duration of the event. Here’s how it works. We will begin the contest with the Evaluation contest. A speaker from another Toastmasters club is given the opportunity to speak at our club for a time duration of 5-7 minutes. Up to 5 of our club members sign-up in advance to compete for the title of Best Evaluator. Each evaluation contestant listens to the speech and then they exit the room so that contestants cannot listen to each other’s evaluations. As they are brought in one-by-one, each contestant provides an evaluation of the speech they just heard. Lots of positive reinforcement is provided to the speaker and then a few things for him or her to work on for future speeches. Whoever gives the best evaluation within the 2-3 minute time limit advances to the Area contest the following week. The second portion of our contest is the Humorous Speech Contest. We usually have three or four contestants each year for this part of the contest. The time duration given to each speaker is 5-7 minutes. The idea with a humorous speech is to be funny but include purposeful content in the presentation as well. Whoever impresses the judges with their strong speech structure, deliver, and humor, advances to the Area contest the following week.